My job is really easy in that I get to choose brands to work with, and am given opportunities by people such as the lovely Latina Bloggers. This time was no different, work with a cheese company that I have been eating for many years? Sign me up! 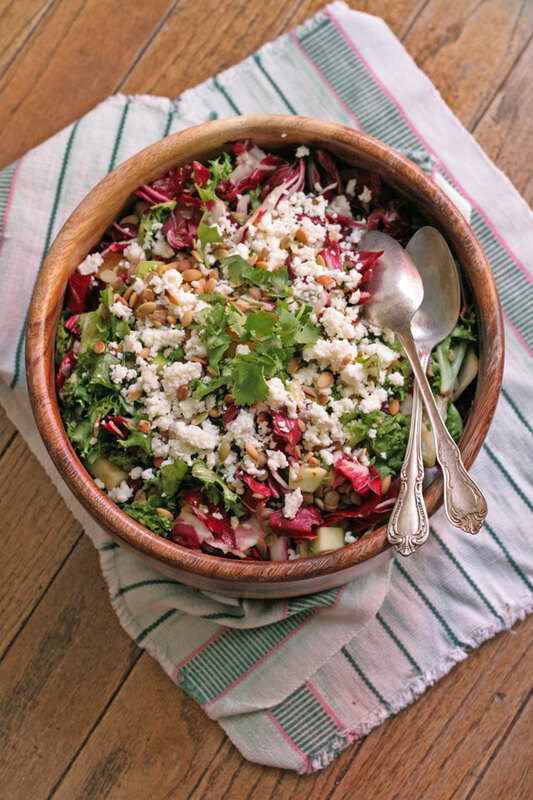 Queso Fresco was my first choice, and I came up with a unique and perfect way to highlight its subtle flavors with this warm Fall flavor salad. Queso Fresco is much like a mild feta in the way it crumbles. It’s the perfect crumble cheese, it’s not a melty cheese. But as a child, well, and adult, I have been known to warm up a corn tortilla over a stove flame, and crumble some queso fresco on it, roll it up and off I go. It is a warming snack, perfectly salty and satisfying. This was my opportunity to show case this cheese that can be used in many different ways. Check out the new Cacique Facebook Page, and enter to be a member of the Cheese Society, it’s pretty cool! welcome package with $5 in coupons. for the Cheese of the Month. 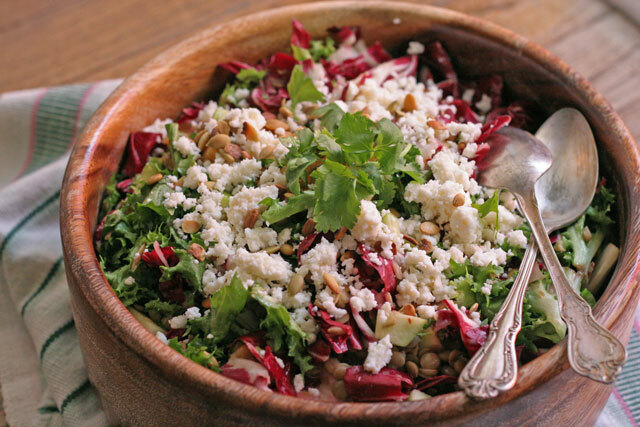 This salad would be great for a weeknight meal with plenty of leftovers. It serves eight large portions, or ten smaller ones. If you are having vegetarians over for the holidays, this is a great way to have alternative protein packed dish choice for them. Also note that you can make this the day before a holiday event, and serve at room temperature so you can make ahead easily! 1. In a medium bowl, place the orange juice, rice vinegar, honey, mustard, salt and pepper, stir to combine. While whisking, drizzle the olive oil in a steady stream until it is all gone, and whisk to make an emulsion. Taste for seasoning, does it need salt? Or place it all in a jar, screw on lid and shake vigorously. 1. In a large bowl combine the warm lentils with 1/2 of the dressing, toss to combine. In another bowl combine the radicchio, endive, apples, mandarins, and the other 1/2 of the dressing, toss to combine. Combine the lentils and greens. Taste for seasoning, does it need more salt? Serve in a large bowl, garnish with the Cacique queso fresco and cilantro. Serve warm or room temperature.